Every now and then I like to fish places more for their ambience than the potential for huge numbers or big bass. 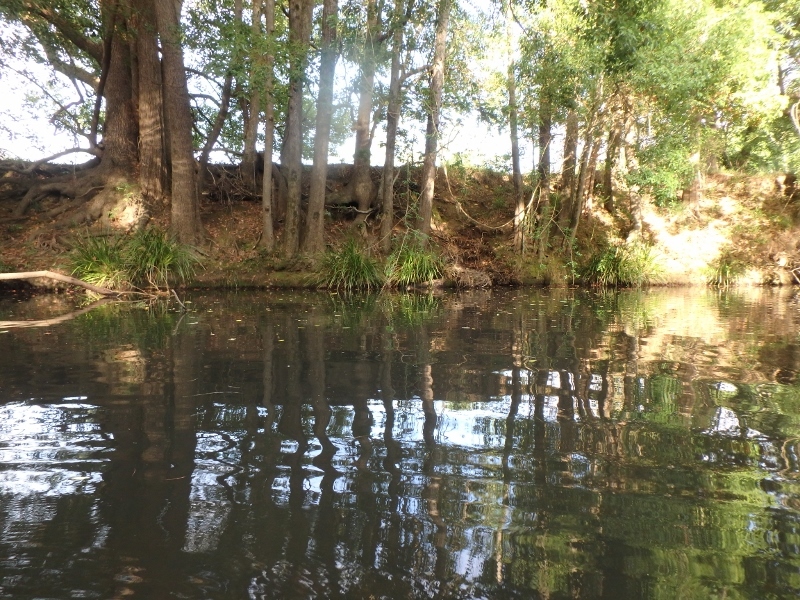 I have a few locations up my sleeve where the riparian fringe is more or less intact along huge stretches of the river and the sights, smells and sounds of nature are the draw card rather than the fishing. Not everyone will understand that feeling but I know there are a few that fish in these places just for the sense of peace and connection to nature rather than the fishing. So it was that I decided to drive to one of these systems and soak up the world around as I cast around hoping to find a few fish as an added bonus. Immediately after launching I got into the action with multiple missed opportunities in the first 5 minutes. 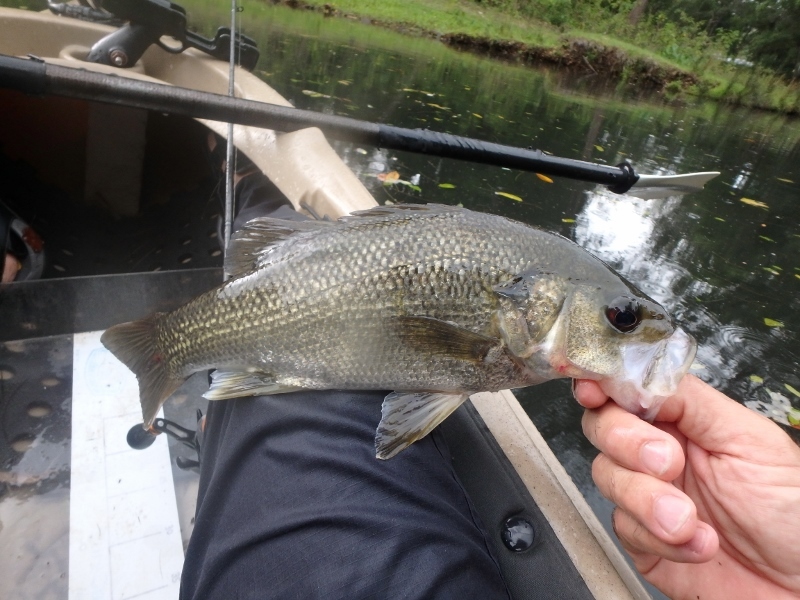 The bass seemed a little lure shy and were hitting the lure half-heartedly and then shying away soon after. The launch pool has been an amazing place over the years with tallies of over 10 fish in the first half hour not uncommon. I have also captured some great videos as well from this location. On this day though I missed about a half dozen fish in this pool followed by a couple more in the next pool and the only thing that kept me moving forward was that at least the fish were interested, which was better than not getting any interest at all. 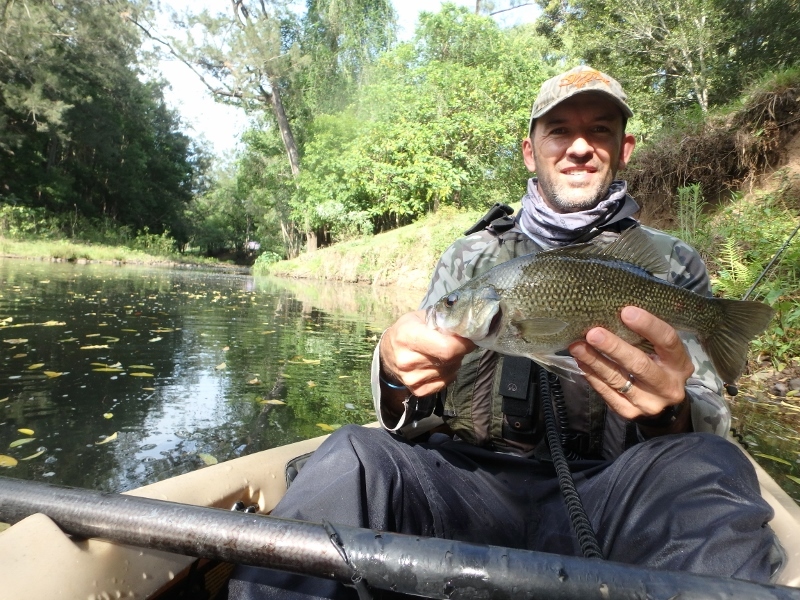 Finally after about four pools where I had failed to make the most of numerous opportunities I finally cast at an undercut bank in what I would regard as a relatively shallow pool and I finally managed a rat that would at least get the donut monkey off my back. Suddenly I heard the loud humble of thunder and I couldn’t believe a storm had brewed up at 10AM in the morning. Normally they would build up in the afternoon and I was a little annoyed that this one had the potential to ruin my day. The system I was in was notorious for rising really fast and being caught in a flash flood was not the way I wanted to spend my day. Luckily a quick look at the BOM showed that the storm would skirt past my location and although I did manage to get a little damp, the rain was only brief. Up a little further there was some nice submerged structure out from the bank and although it was still relatively shallow it was the deepest, darkest part of the pool and as a result it held quite a few rats that would smash my Sammy 65 and although most failed to hook up I still manage another rat although it was a little bigger. 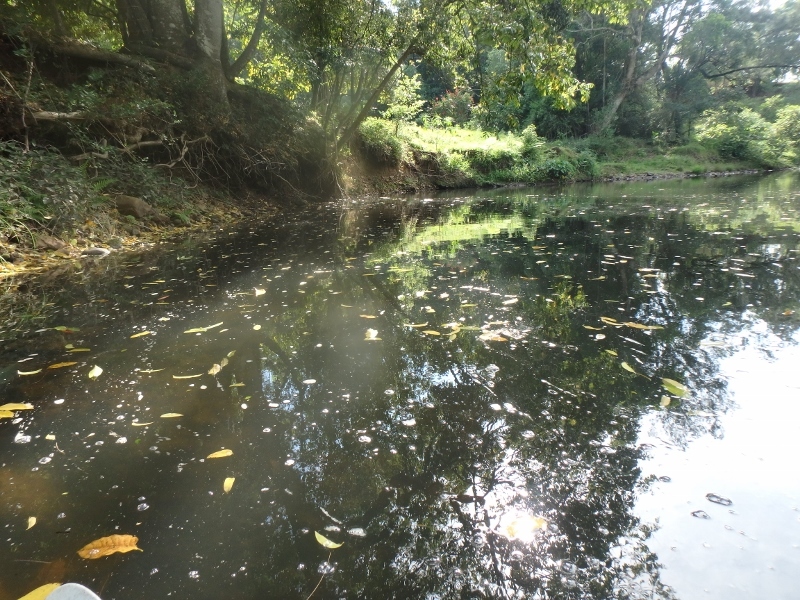 The next pool was quite deep and even though the river itself was a little shallower than usual it still held enough water to make me confident that a few fish would be residing here and ready to ambush my lure. It also held some of my favourite structure, steep rocky outcrops descending directly into the water to form a steep drop off. Inter-dispersed amongst the rocks were tufts of sedge, which also provide ideal habitat for marauding predators. 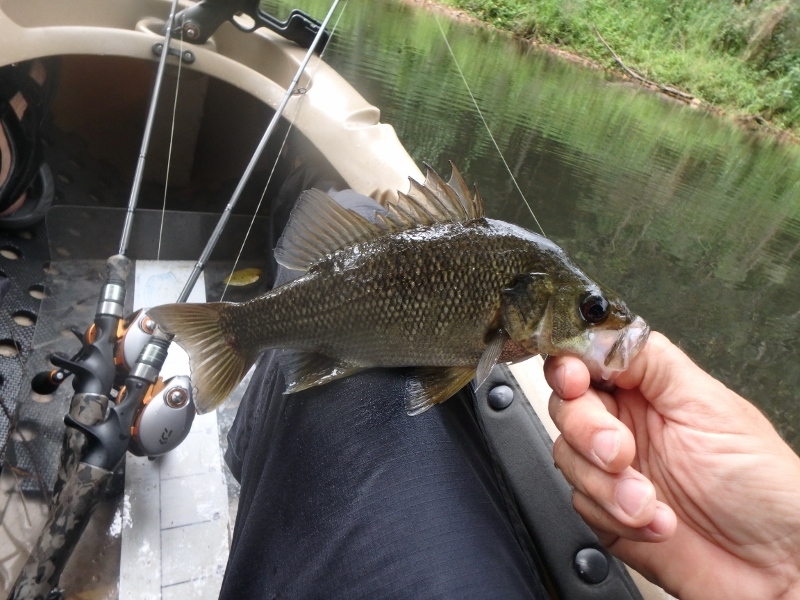 Initially I cast along the more exposed edges until I finally targeted a nice shady pocket where I had caught many bass in the past. 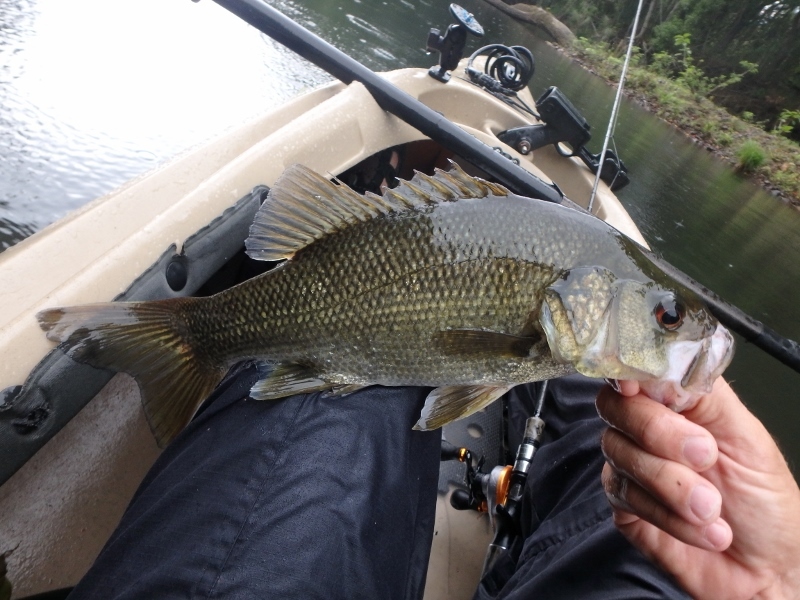 Sure enough after a few twitches the Sammy was smashed and I was onto a nice bass. 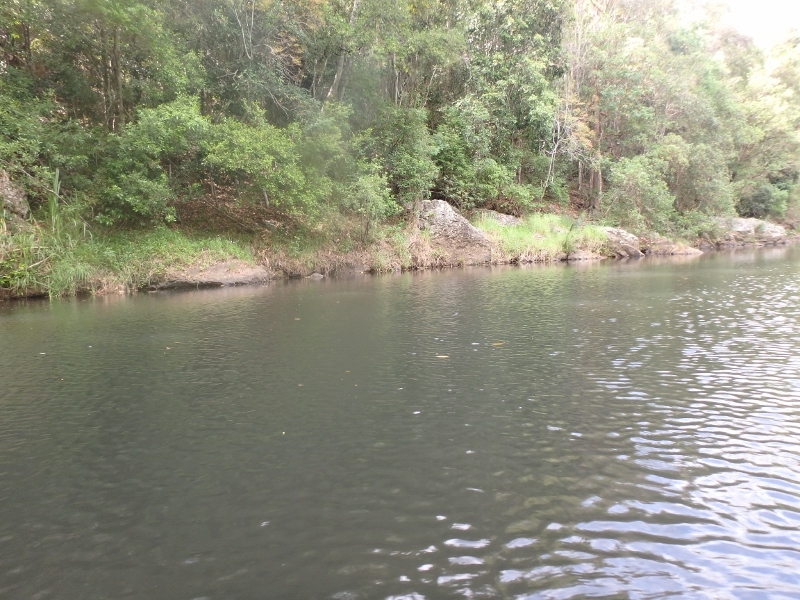 The great thing about these rock walls also is that they are also relatively devoid of structure and so the fight is typically in favour of the angler. 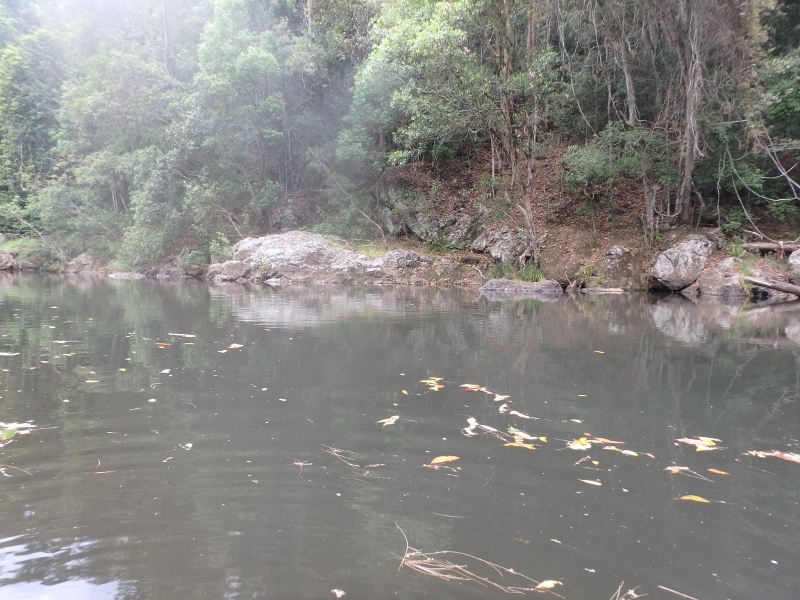 As I approached the head of the pool there was a nice current that passed beneath an old fig tree. 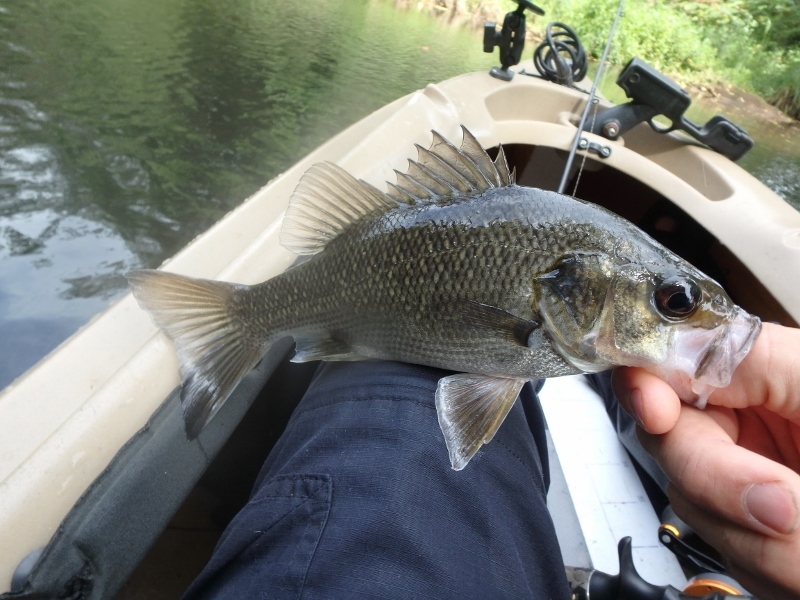 The bank had been strongly eroded in the past during stronger flows and I knew that the shady area again had held bass in the past. 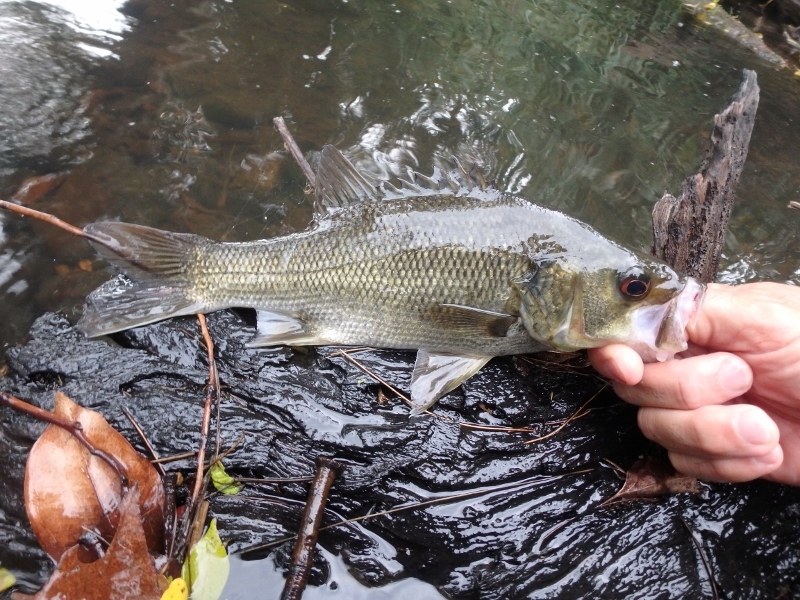 After a few casts tight to the bank a bass eventually flew up to the surface and plucked my lure off the top. 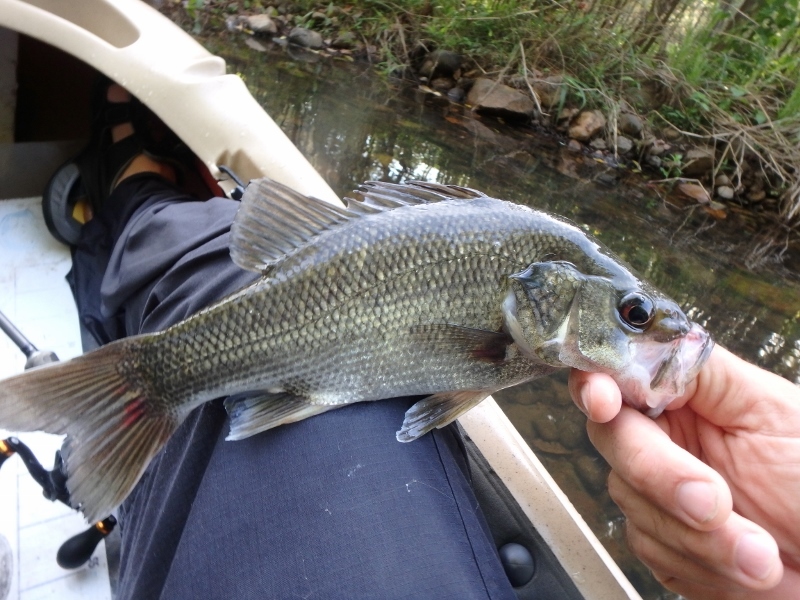 After a short fight I had another bass in the thirties netted, photographed and released. I paddled up through some beautiful country with some of the most spectacular waters that I have seen on my many trips. 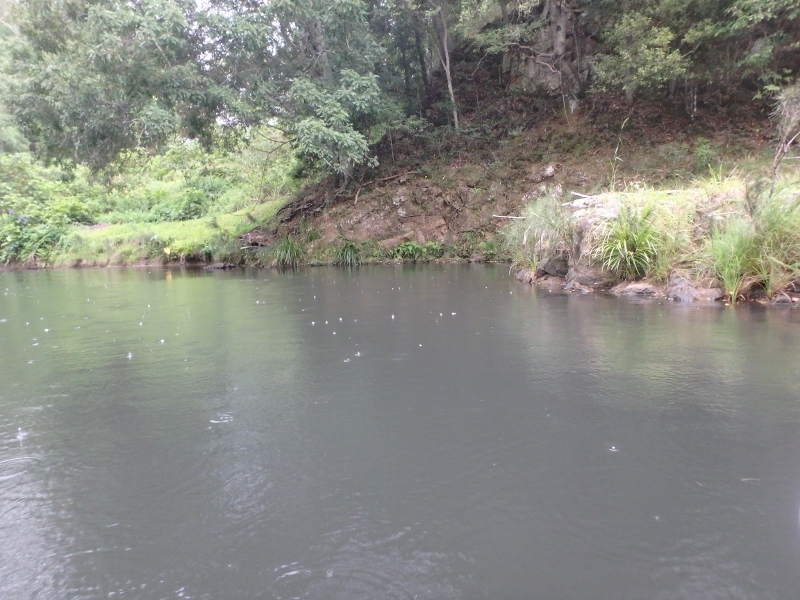 It is such a relaxing river and the rainforest surrounds and myriad of animals lurking around the river bank makes the fishing a bonus. 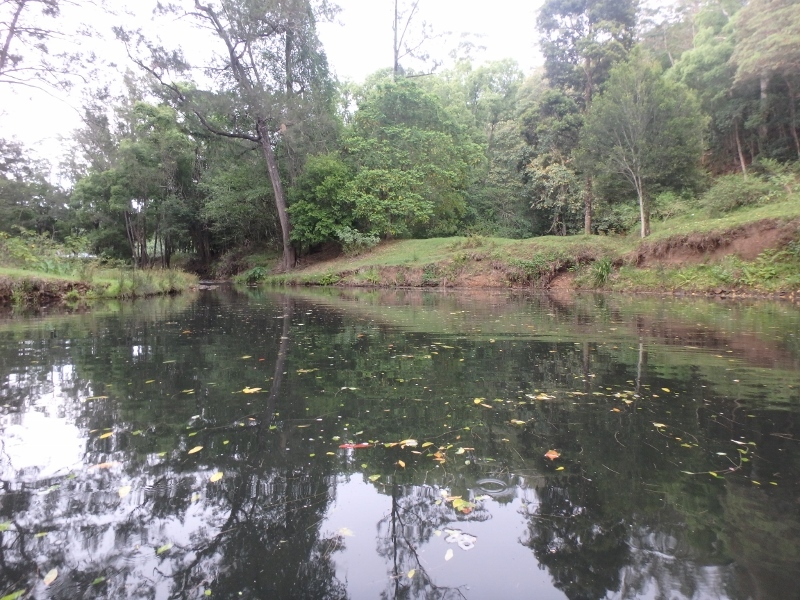 Sadly on this trip the bass seemed to be absent from this pool and I then went through a small period of missed hits, including one good fish, before I finally reached my final turn around pool. Like other pools in this system the bank was covered in scattered rocky outcrops and boulders and fringed with sedges. 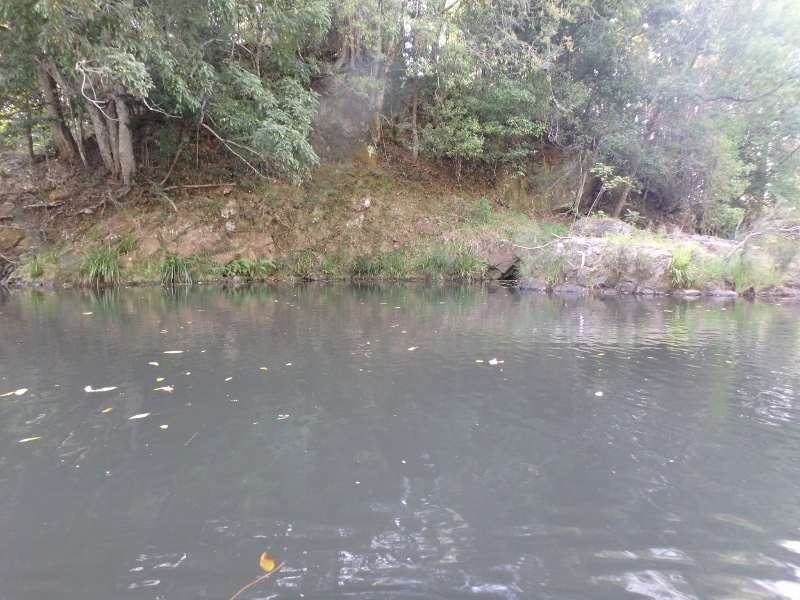 At the end of the pool was a very deep hole and amongst the boulders was a massive pile of timber that has held good bass in the past. 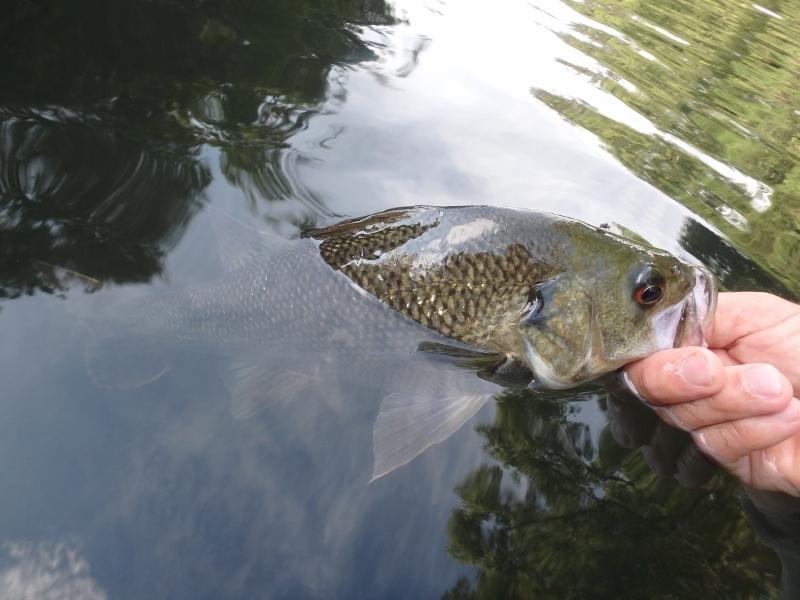 As I made my way up the pool I picked up some small to average bass amongst the rocks but sadly I could not find a bass in the biggest and gnarliest structure at the top of the pool. I missed a few others in the back eddies just below the run from the pool above before I pushed up a little further upstream. I knew this was my final pool and that considering the rest of the river was quite low that the majority of this pool would be more or less un-fishable. 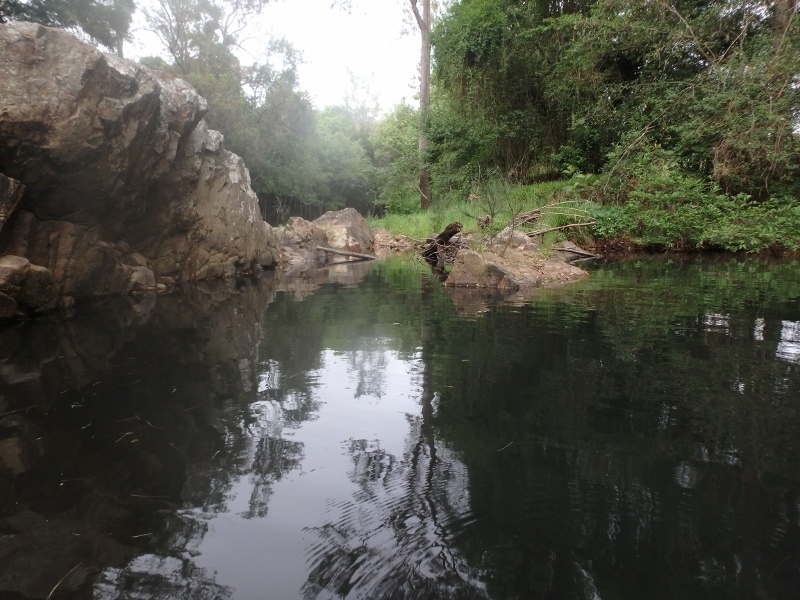 However, the very top of the pool dropped off a little and centred in the middle of the pool was a massive rocky outcrop. The banks were also fringed with vegetation that looked awesome. 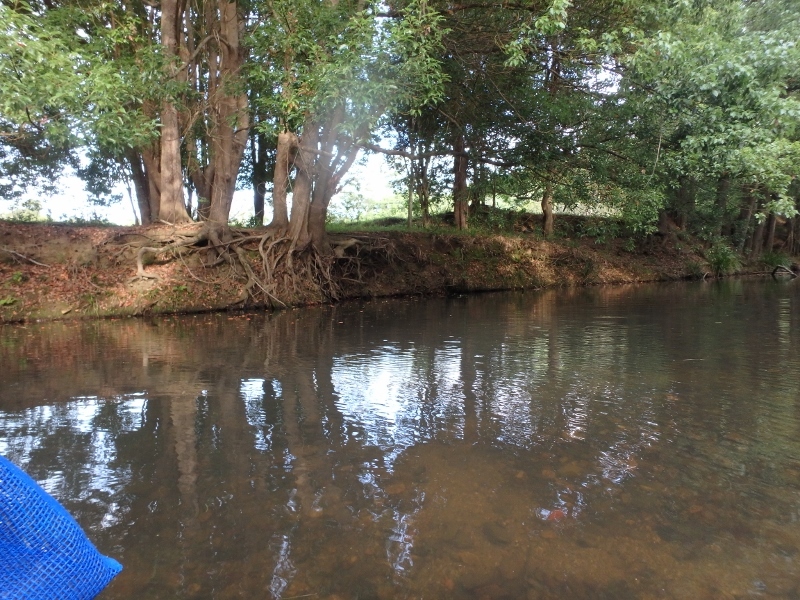 Unfortunately though the wind had carpeted the waters surface with leaves so thick that it was impossible to get a cast in anywhere near the bank. 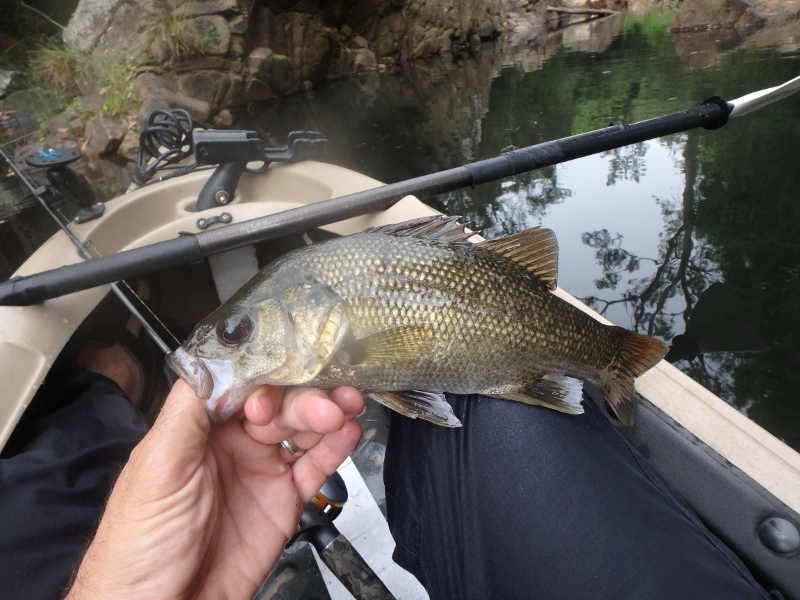 However the rocky outcrop had some clear water surrounding it due to the flow of the current from the pool above and a cast in here was subsequently smashed and I netted another low thirties bass. 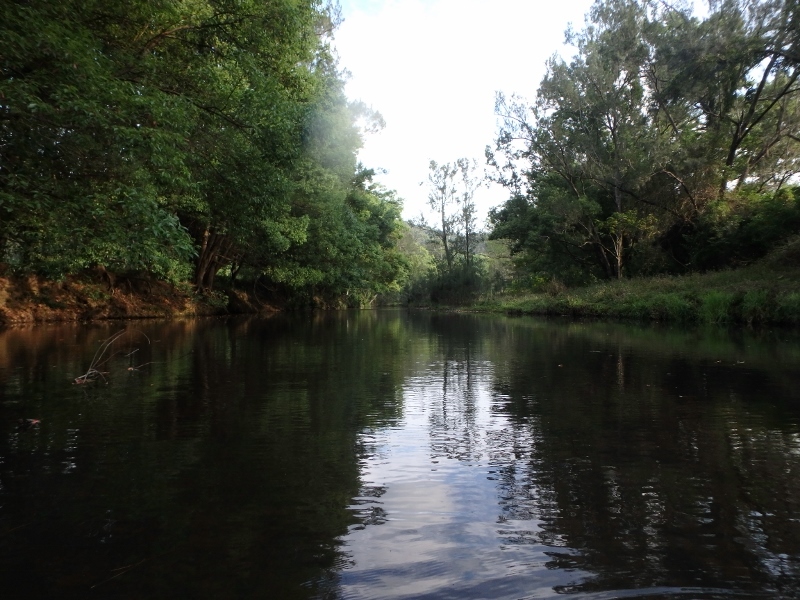 At this point I turned around and headed downstream. 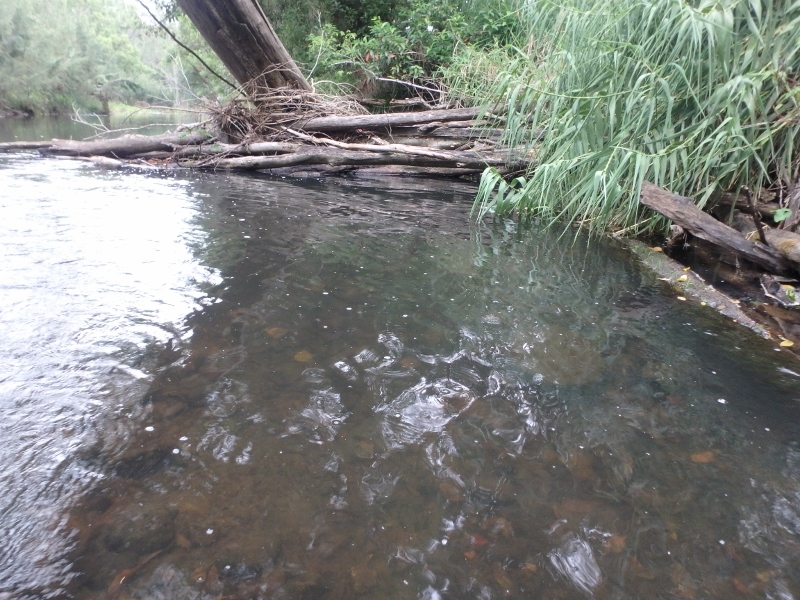 I intended to head downstream of my launch point and fish a few pools below before heading home. 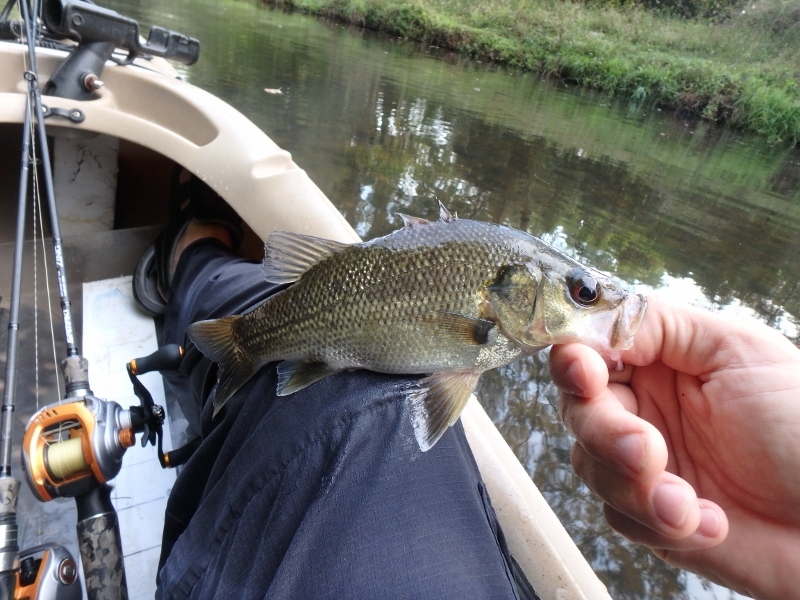 On the way back I cast at a few structures where I had missed bass on my upstream journey and managed to pick up a couple on the way home. 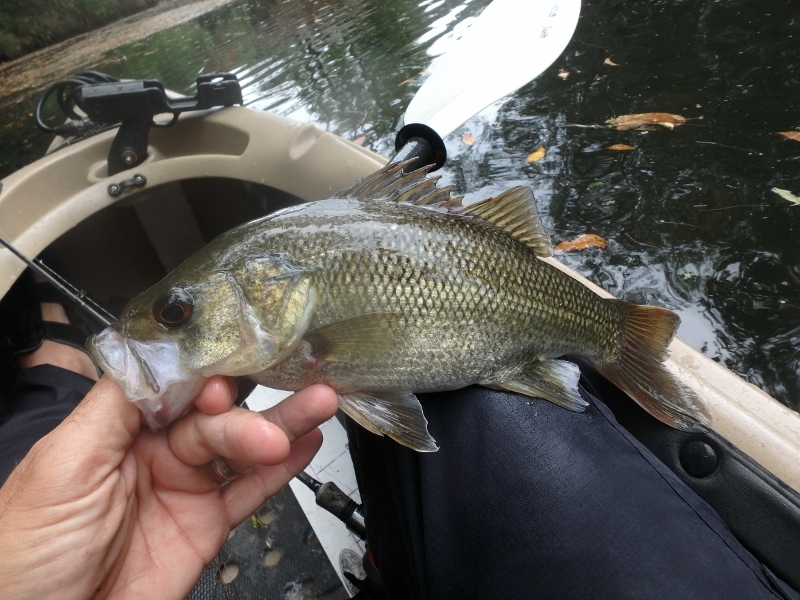 My biggest bass of the day at 36cmFL was found on the very same steep rock wall I had caught another bass on during my upstream paddle. Like the previous fish it was an easy fight in the open water and made for a great mornings fishing. 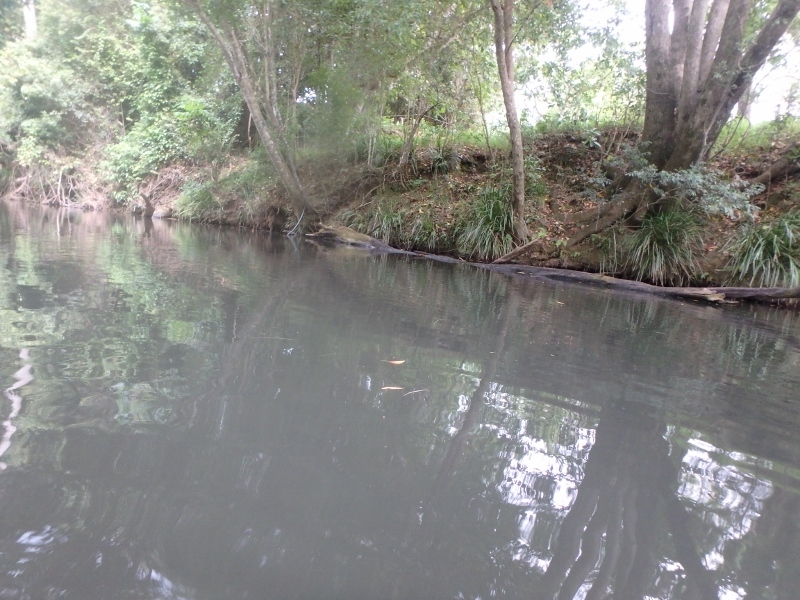 Further downstream I came across a small logjam situated directly below some very strong current that looked very bass worthy. 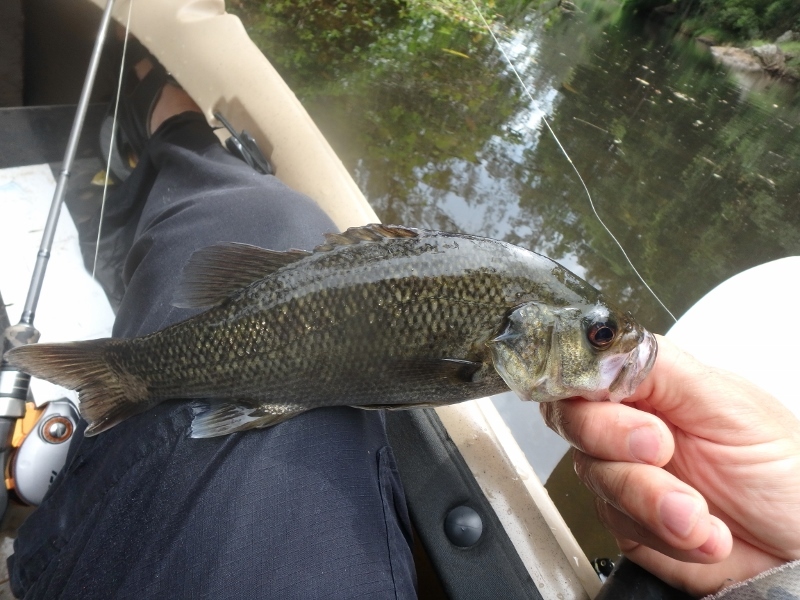 My first cast into the eddies in front of the jam was rewarded with a hit and a miss and this was followed by another three casts with missed hits until the bass finally connected and I was able to negotiate the fish into the palm of my hand for a photo. The rest of the trip back to the launch point was uneventful with a few missed hits as I made my way downstream. I then headed past the car and into the pools below and managed a few more hits but I was still struggling to get them to connect. Eventually though there was another loud rumble of thunder and a quick check of my phone that this storm was much bigger, much more serious and bearing down on me very fast. I made the wise decision to head back really fast to the car and get my gear stowed away and just as the rain started I jumped into the drivers seat. The trip home was hell as the storm front was rolling in at such an angle that I more or less was in the middle of it all the way home. Luckily there was no hail and the heavy rain was the only thing I had to contend with on my journey. 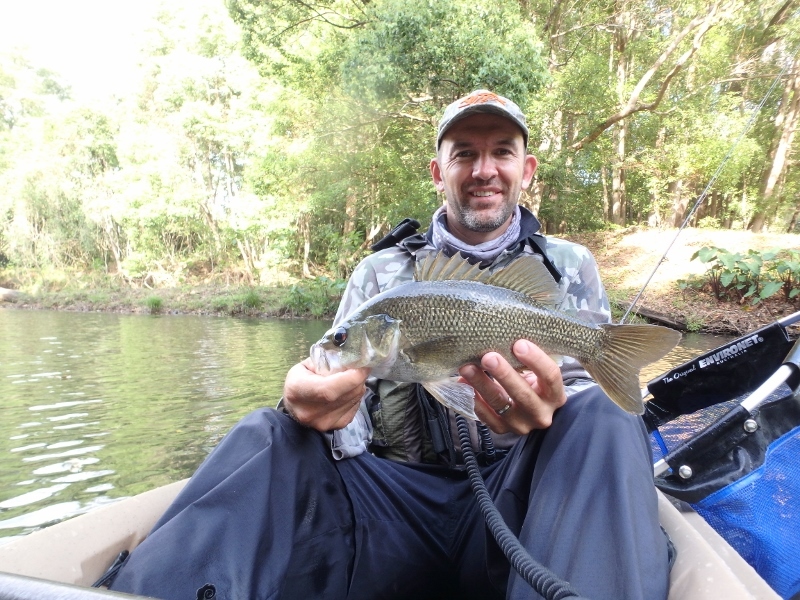 So even though my trip was cut a little short I still managed 15 bass in one of the most picturesque systems I know of in SEQ.